More, recording, more practicing, more performing. I don’t remember how I got the connection, but I was asked to create the original music for “Something You,” an industrial film made by Ship’n Shore. In the course of recording a demo, I rediscovered the sound of miking amps instead of going direct, here placing the mic close to the horn on the Ampeg B18-X. 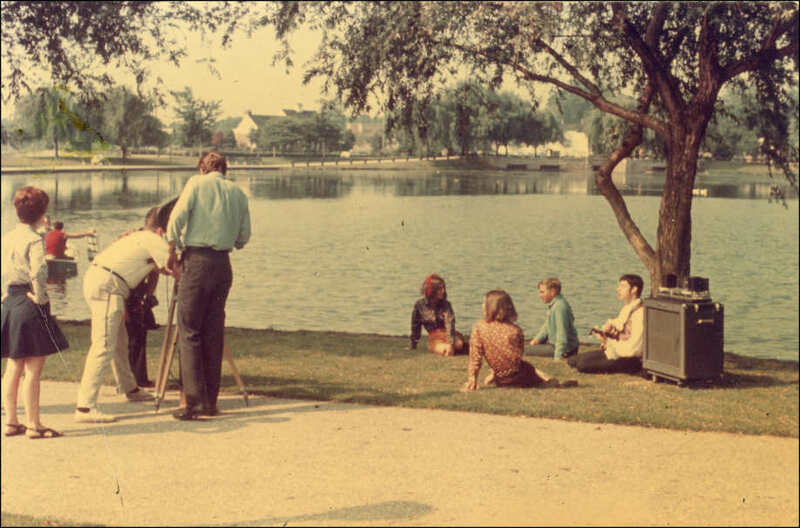 1968 – filming “Something You” – we always brought our B18-Xs to the park in those days. As I recall, my demos were a tad too “rocky,” so I was asked to take it down a notch. Also, the corporate heads were uncomfortable about having a high school student produce the soundtrack in his home, so I recorded the soundtrack (about 20 minutes of music) at Golden Crest studios in Huntington Station with Clark Galehouse. Clark was very helpful and gave me great tips about recording – up until then, I had been self-taught. The soundtrack came out sounding very professional, but, to my ears, very polite (which is what they wanted). 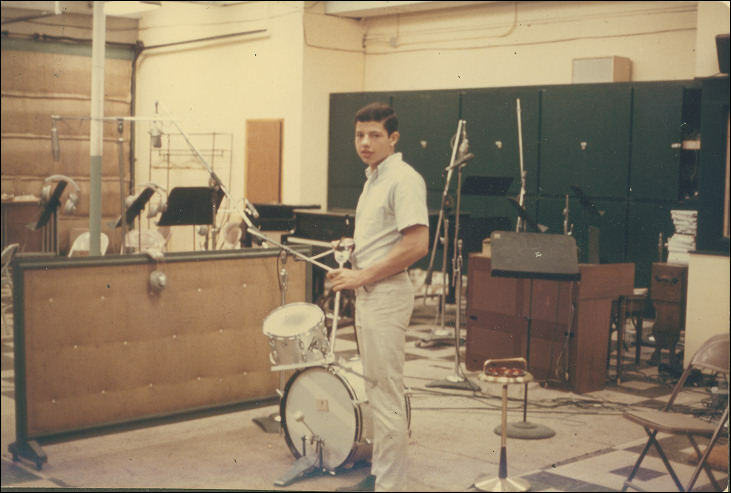 1968 – recording the soundtrack at Golden Crest studio. The monster LPs of 1967 had affected everyone – Are You Experienced (Hendrix), Surrealistic Pillow (Jefferson Airplane), The Doors, Strange Days (The Doors), Moby Grape (Moby Grape), Vanilla Fudge (Vanilla Fudge), Sgt. Pepper (Beatles) and others. I can’t recall another period when so much important new music was released in such a short interval of time. I was into all of it, especially the West Coast psychedelia, and, armed with my Vox wah-wah pedal, Jordan Boss Tone (fuzztone), and Slingerland 4-piece set (purchased used for $100), I jumped in. To make the sound more “far out” I tried miking the drums through the reverb in my Ampeg B12XT. This next improv has something of a Doors feel and was one of my first tests of stereo sound-on-sound. I realized that I could record a guitar part on Channel 1 of machine A, and then copy or “bounce” it to machine B while adding another part on Channel 2. I now had two parts, but now they were in stereo. I could then copy these two parts back to machine 1 while adding another part on either Channel 1 or Channel 2. I didn’t have a stereo mixer, so the parts were 100% in the right or left channels. Primitive, but stereo. More experimenting, especially with noise and music concrete (another story). I think it was Bob Micklin, the music critic at Newsday who recommended me to Raymond Scott. As I recall, Scott was doing music for a project and needed some “rock” music. 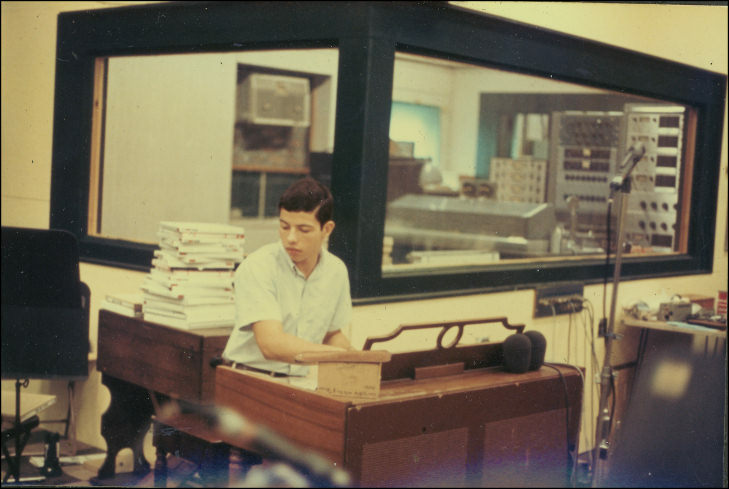 In April my father drove me to Scott’s studio/home – he lived in an industrial park off of Route 110 in Farmingdale. Bob Moog tells a charming story of his father driving him to see Raymond Scott’s home studio when he (Scott) was living in North Hills (on the north shore of Long Island). Multiply Moog’s impressions by 100 and you’ll get an idea of how I felt when I walked into this and heard some of the music he was working on at the time. I recently found an unsigned contract with Scott which said that, for $300.00, I would license him to use an original song called “The Time to Live Is Now.” I don’t know if the contract was signed, but I do recall going to Scott’s with my guitar and playing some parts. Here is part of a demo for the song that I did at home. I had noticed Ringo’s double-tracked drums on songs and tried that effect (with tambourine as well) here. I borrowed my uncle’s clarinet and made a variety of noises. 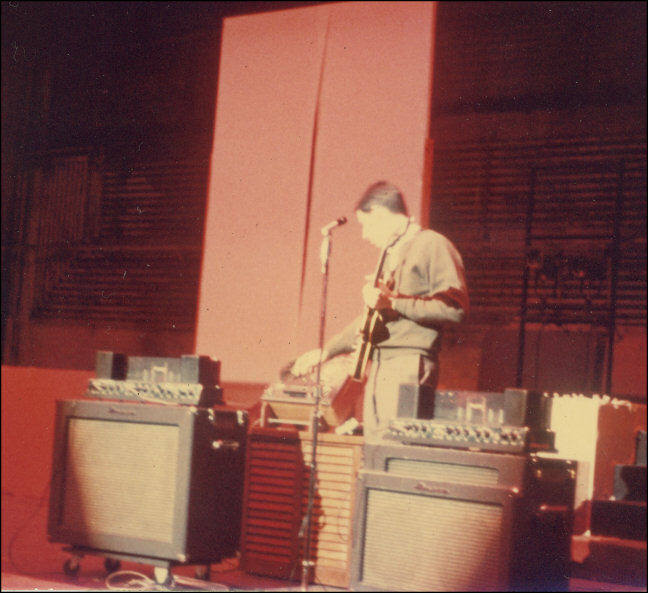 Here I’m using my Danelectro Shorthorn guitar (tuned to C) and am again using the Ampeg bass. (I never appreciated how difficult that instrument was to play until I played a Precision bass. To make matters worse, I kept the original gut strings, which were monsters designed to help it sound like an acoustic bass.) I also tried to get Carmine Appice’s distorted drum sound heard on “Shotgun,” from the 1969 Vanilla Fudge LP Near the Beginning. The drums on that song are over-compressed and distorted to shreds – I loved it. Unfortunately, Appice’s sonic chaos is destroyed by a polite, clean tambourine overdub – an early example of sonic buzzkill. Taking my cue from Hendrix’s line, “Trumpets and violins,” I tried to create “choirs” of clarinets and violins with a groove reminiscent of “I Am the Walrus.” After about 14 overdubs, however, everything basically disintegrated.